My New Year resolution was to finally start learning Nepali properly, rather than just try to pick it up as I go along. I was determined to start before the end of January and just managed it, taking my first class on the 31st. I've had a lesson most days since and feel like I'm making good progress, although don't worry fans, I'll be writing this blog in English for a good while yet! I've always found learning languages difficult, but for the first time I actually understand the verb conjugation and the various tenses, and although I still need loads of practice, especially with words full of vowels (try khuwaaueu (we fed) with it's five in a row!) I'm confident that I'll continue to improve and be able to meaningfully communicate with schools and my own family. 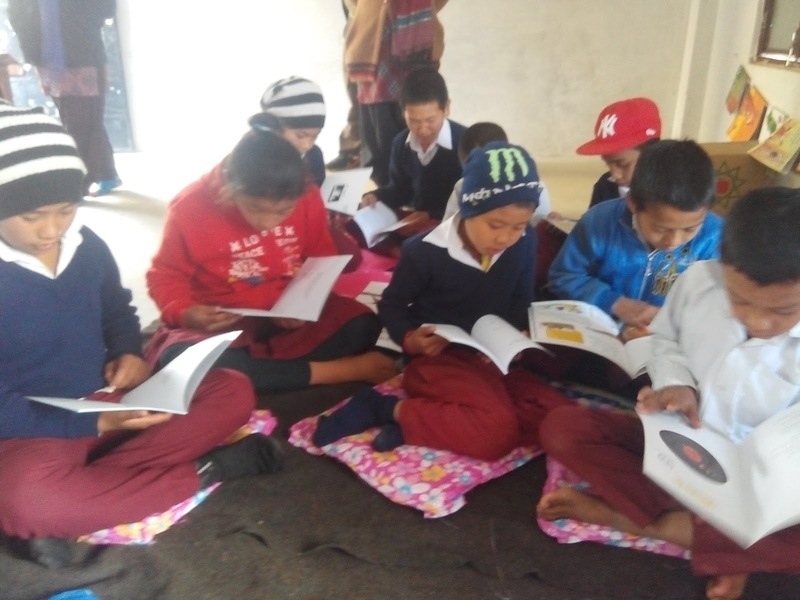 We've continued setting up the new libraries and they are now established at Nava Durga Primary School in Pipaldanda, Himalaya Primary School in Mahachhap and Devwani Primary and Secondary School here in Tansen. 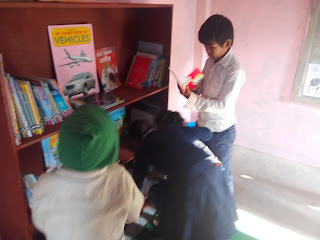 The children have been really enthusiastic, often sneaking away from lessons or coming via the room we are setting up between classes to take a look. In all the schools, we've talked about how to care for the books and keep them in good condition and the children, despite their obvious excitement have been acting very responsibly. We'll be returning to these schools over the next couple of weeks to do more work with the teachers and the students, but it really has been exciting to see just how much children value the books we have delivered. 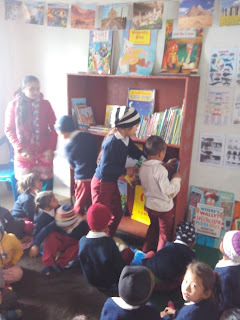 We re-visited the first library we established at Kalankee Primary School. It turned out to be a very necessary visit, as although the school were using the library regularly and taking classes in, children hadn't been borrowing books because teachers were still unclear on how to fill in registers. 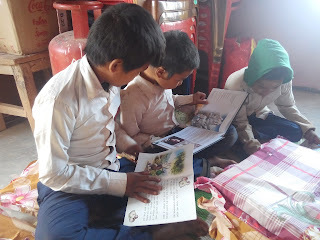 Rather than just explain this again, we had each class in the library, demonstrated some reading activities, assessed reading levels together and had each child choose a book to take home. 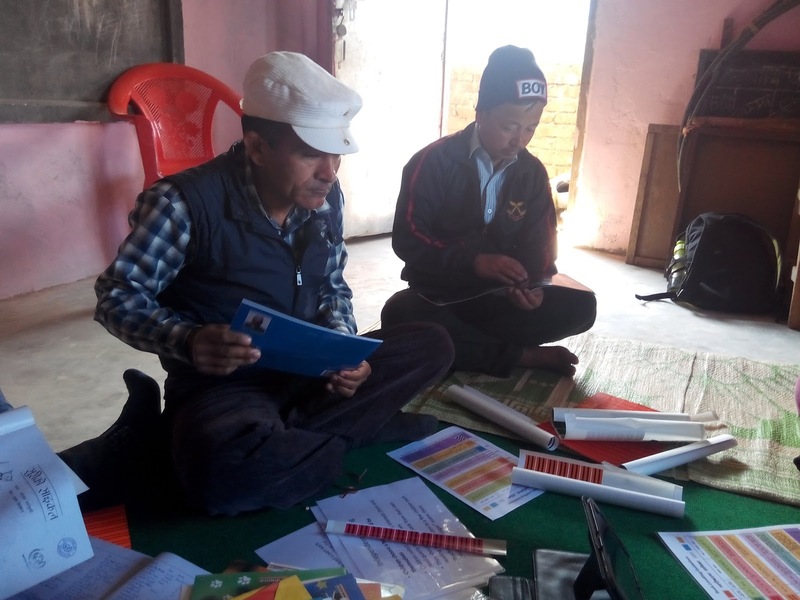 Now each teacher has done this with us, they are much more confident to be able to continue alone. We'll still return again to see how things are going and help clear up any difficulties or problems. I've also managed to fit in my latest local TV appearance, this time having a rant about the amount of homework and (mainly pointless) copying children are expected to do, especially at primary level. This was at the Hope and Dream Montisorri School anniversary celebration, where I did enjoy seeing all young children (year 1 and younger) perform various cultural dances from various ethnic groups in Nepal, including my niece who did a great job! The day after was my birthday, and although I wanted to go to school my wife banned me, so I spent a more relaxing day at home and enjoying a nice meal at one of Tansen's new hotels. Hope and Dreams isn't the only school celebration I've attended, as I was invited to Basanta Primary School in Bagnas for their 'school day'. We had to drop support for this school last year when they introduce fees, which goes against our policy, but I was curious to see how the school had got on since and this seemed an ideal opportunity. It was great to see some of the familiar students and teachers again and I enjoyed seeing the children's performances (although I can't say the same for adult's speeches). 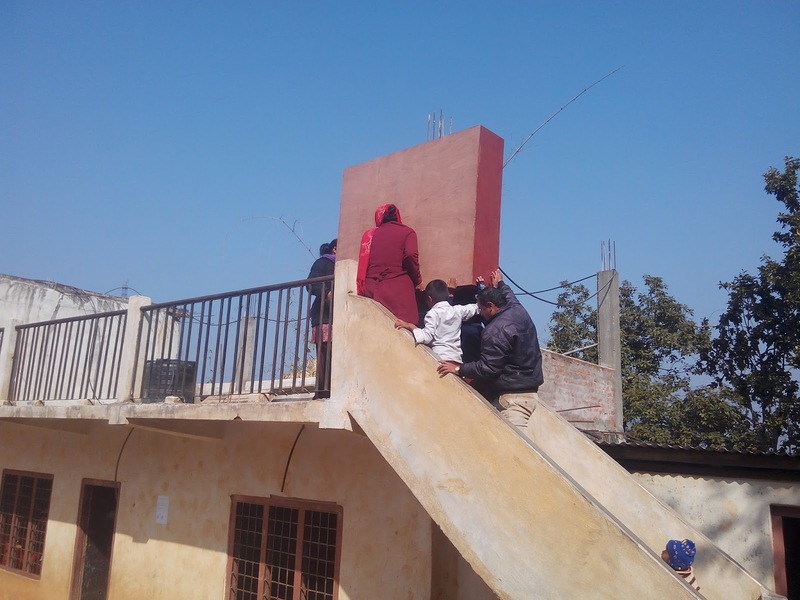 The school has taken on several new teachers, despite no very significant rise in the number of students, and although they've paid for some new school gates and exterior painting, the classrooms remain as dark and dingy as ever. I came away with the overall impression that the money they are collecting from fees isn't being used effectively to improve learning, and many worries about those students who's parents simply can't afford school fees. I've been interviewing children again, this time at JVT School in Tansen, to get ideas about what they really need in a learning resource centre. I haven't got all the videos online yet, but they'll be available on our youtube and facebook pages. 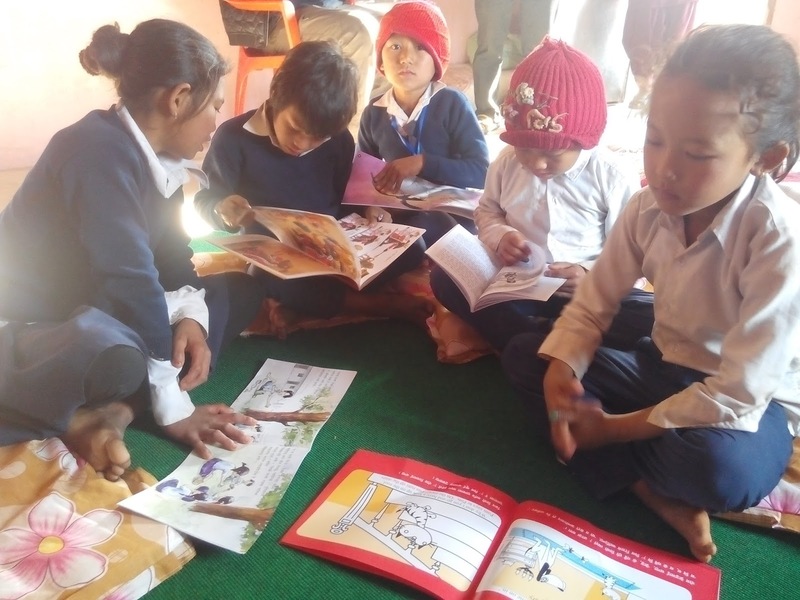 The children gave some great ideas, were clearly very motivated to learn and to have some practical experience to go with the theory they get in school. Next up will be a visit to Okhaldhunga, to establish our final library at Gyanodaya Secondary School. We've also got a visit to the eye hospital planned with Binod, a little boy from Kalankee Primary who we hope to be able to help. Apart from the school visits, there is plenty going on in Tansen, with a food fair coming, as well as the bi-annual Mela; a huge fair with some incredibly dodgy merchandise and even dodgier rides!